But the appeals court on Monday ruled that about half of the sum cannot be seen as bribes. It also reversed several of the lower-court decisions, including the conviction of Mr. Lee on charges of violating the country’s laws limiting the use of foreign currency in connection with the payments. It reduced his sentence to two-and-a-half years and suspended it, leading to his release. 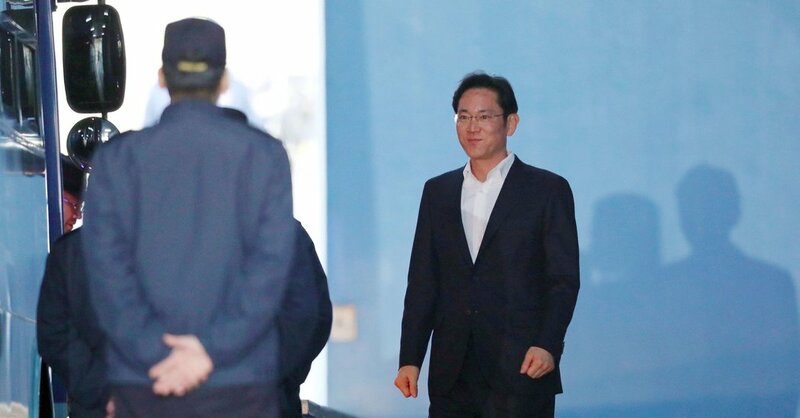 Mr. Lee, wearing a dark suit and no tie, emerged from the court with a slight smile, then was taken to the prison in Seoul, the capital, where he had been held since his arrest. He emerged shortly after as a free man. He said he was going to visit his father in the hospital. Samsung is the largest and most powerful of South Korea’s chaebol, as the country’s giant family-run companies are known. Its businesses include smartphones, microchips, insurance and shipbuilding. The chaebol have dominated the country’s economy for decades. Early South Korean governments gave them tax benefits, cheap electricity and protection from overseas competition. In return, the chaebol were expected to contribute to government projects. Over the years, executives at a number of chaebol have been accused of funneling money to the coffers of officials and their relatives and associates. South Korea has often responded with light punishments for business leaders caught in corruption scandals. Many chaebol bosses convicted of crimes have been pardoned or given suspended sentences. Some have even continued to run their empires from behind bars. Mr. Lee’s father has been convicted of white-collar crimes twice — and twice he has been spared prison time. The accusations against the younger Mr. Lee were part of one of the largest influence-peddling scandals in the country’s history, one that has already toppled Ms. Park. Ms. Park had met with him and other chaebol leaders to ask for contributions to foundations controlled by Ms. Choi, Ms. Park’s confidante. Within months, Samsung had donated millions of dollars to the foundations and put millions more toward the training of South Korean equestrians, including Ms. Choi’s daughter. Mr. Lee’s lawyers acknowledged the payments but argued that Ms. Park had coerced Mr. Lee into making them. The defense also argued that Samsung did not receive any favors or special treatment in return. Mr. Lee’s year in detention does not appear to have dented Samsung Electronics’ ability to earn gangbusters profit selling smartphones, televisions, refrigerators and memory chips. With demand worldwide for powerful servers and data centers continuing to rise, investors think that Samsung’s semiconductor business, where it earns the bulk of its profit, will continue to throw off money. Still, given Samsung’s size and long history, the scandal has divided South Korean society. Many young people are weary of the hold that the chaebol exert on public life. The sympathies of older South Koreans, who credit the chaebol for transforming their war-ravaged, agrarian nation into a global export powerhouse, tend to lie with Mr. Lee. August 7, 2018 Comments Off on Ellie Goulding Is Engaged To Caspar Jopling. See Their Super Traditional Announcement.